Mr Yeats returns to Killala in November for another in this series of community heritage events. The highly successful Mr Yeats’ Visit To Killala events celebrate the influence that Killala, its people and events had on William Butler Yeats, most notably as inspiration for his play ‘Cathleen Ni Houlihan’, set in 1798 Killala. Mr. Yeats visit to Killala is a community-based event celebrating the influence that Killala, its people and events had on William Butler Yeats. Yeats wrote ‘Cathleen Ni Houlihan’, a play set in Killala in 1798, in 1902. In 1904 this play would be performed on the opening night of the Abbey Theatre with Maud Gonne in the lead role. The character of Cathleen Ni Houlihan would be immortalised by the painting of Lady Lavery which featured on Irish bank notes for over 50 years. The harp from the painting was adopted as the symbol of Ireland. 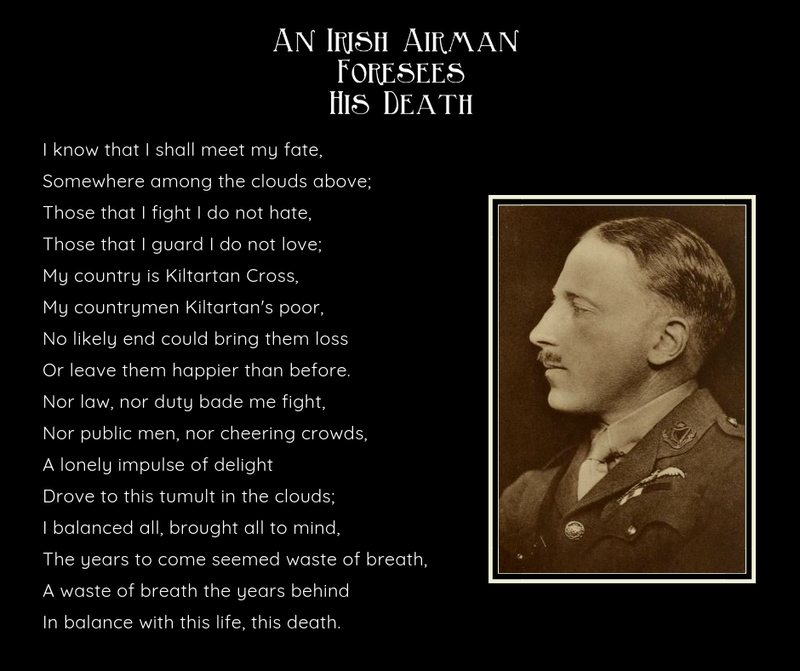 Taking place in Killala Community Centre, Killala on 10 November 2018, this year’s event will take WB Yeats’ World War 1 poem ‘An Irish Airman Foresees His Death’ as a starting point for a programme of music, song and original arts commemorating the 22 young men of Killala who died while fighting the Great War. As part of the event, the lives of the 22 soldiers will be researched and where possible, their stories brought to life, both in the context of the community and homeplace they left behind and in the context of their experiences at war. As in previous years, the cultural programme will be prepared and performed by the local community, with participation from local schools, the North Mayo Summer School and the North Mayo Heritage Centre, led by Maureen Lawlor’s Centre Stage Vocal Academy. Musicians and composers whose music has played an integral role in commemorating Ireland’s involvement in WW1 have also been invited to participate. Organisations such as the Connacht Rangers, Óglaigh Náisiúnta na hÉireann and dignitaries from Ireland, the UK, France and USA have been invited to attend and participate. The event will be supplemented by a community showcase on local radio station MidWest Radio exploring the genealogical aspects of the overall programme and the process of discovery involved. Stemming from the 2016 event, which commemorated 1916, and in particular the role of Killala’s Kathleen Lynn – and recognising the powerful legacy those commemorations had in Mayo and Killala in particular – it is hoped to deliver a similar legacy impact with this event, shining some light on Killala’s fallen young men of WW1 and their stories. 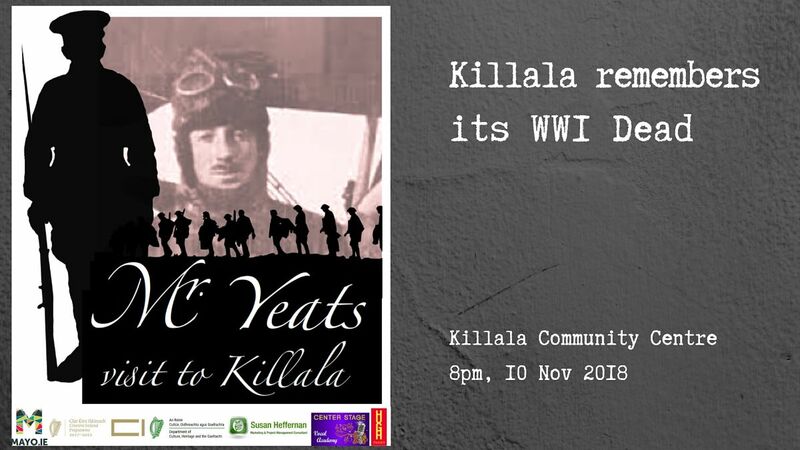 The call is out for Killala’s community to get involved – most importantly, in discovering the stories of the WW1 fallen, performing on the night or behind the scenes. In the lead up to the commemorations, a community showcase will take place on MidWest Radio – live from Killala – exploring the lives of Killala’s 22 fallen men and the process of discovery involved in unearthing their stories. In 2016, Mr Yeats commemorated 1916, and in particular the role played by Killala’s Kathleen Lynn, and recognising the powerful legacy those commemorations had in Mayo and Killala in particular, it is hoped to deliver a similar legacy impact with this event, shining some light on Killala’s fallen young men of WW1 and their stories. Full details of the event and the research involved are available at www.mryeatsvisittokillala.ie or follow the Facebook page. Tickets for the evening will be available online and from Killala Community Centre (adults €10, children €5).